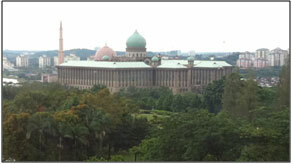 On September 19, 2011, High Road Strategies participated in a “Comprehensive National Development Planning Workshop (With Emphasis on Energy and Trade) Using Threshold 21 (T21) Model” in Putrajaya, Malaysia, at the invitation of the Washington, DC-based Millennium Institute (MI). Dr. Andrea M. Bassi, then MI’s Director for Project Development and Modeling, had led a project to apply MI’s Threshold 21 (T 21) energy-economic model to the economy of Malaysia, working with the Economic Planning Unit (EPU) of Malaysia’s Prime Minister Department. The workshop, also sponsored by the EPU, examined energy and trade issues confronting Malaysia in its efforts to implement its Tenth Malaysia Plan. 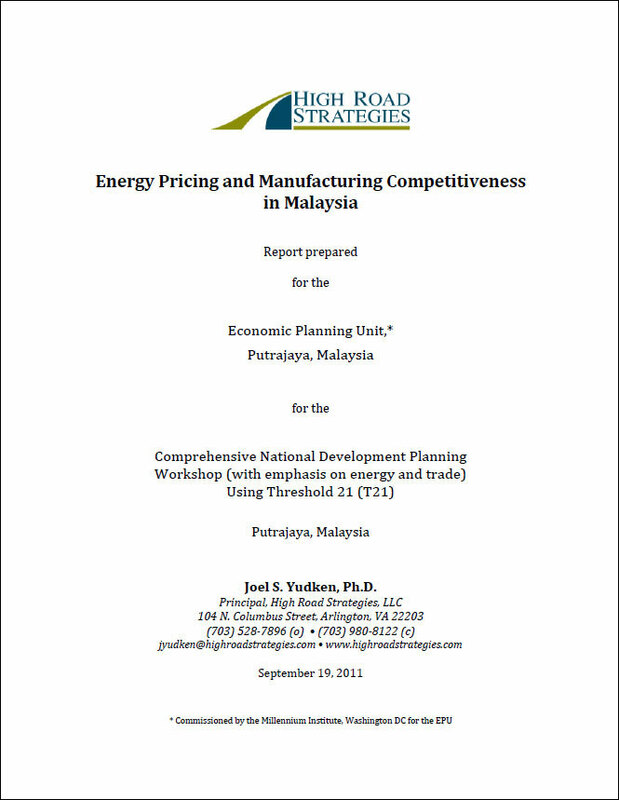 High Road Strategies’ Joel Yudken prepared a report and made a presentation on Energy Pricing and Manufacturing Competitiveness in Malaysia. Greg McGuire, an Independent Economic Specialist originally from Australia, now living in Indonesia, spoke on Free Trade Agreements and their implications for Malaysia. After the formal presentation, Dr. Yudken met with a number of EPU staff and officials for a more in-depth discussion of the issues covered in his paper. The report first provides an overview of Malaysia’s economy and energy supply and consumption patterns. In particular, it outlines major energy policy issues that the country needs to address in achieving its economic development goals. Malaysia has moved into a new phase in its economic development, which centers on a growing emphasis on services, although industry continues to represent an equally important driver of its economy. Key industries in Peninsular Malaysia include rubber, oil palm processing and manufacturing, light manufacturing, pharmaceuticals, medical technology, electronics, tin mining and smelting, logging, and timber processing. Malaysia also has a large oil and gas industry. The government’s Tenth Malaysia Plan 2011-2015 (TMP), developed by the EPU, claims that Malaysia appears poised to move from being a middle-income nation to high-income status by 2020. However, this will require a comprehensive economic transformation, with a shift towards higher value-added and knowledge intensive activities. Energy subsidies. An important element in the plan is removal of the generous subsidies the government provides to energy and other domestic goods. Historically, subsidies have kept market prices down, below international market prices, in a number of important domestic commodities, e.g., petrol, diesel, natural gas, sugar, rice and flour. A recent estimate shows that subsidized gas price for the electric power sector is 74 percent lower than the actual market prices, reducing electric power prices for industrial facilities as well as commercial and residential electricity consumers. As a result, an important segment of Malaysia’s economy has been protected from the impacts of high energy prices and volatile energy markets that they would they otherwise would have been subjected to. There are compelling economic and social reasons today for going down this path. Removal of subsidies, however, would raise serious transitional issues for Malaysia’s economy, if not spark some political pushback. While Malaysia’s electric power sector would be most directly affected, so would major industrial consumers, especially the nation’s important energy-intensive manufacturing sector, e.g., iron and steel, cement, wood, food, glass paper, and, ceramics, which could suffer from adverse impacts, as their energy costs rise. Trade sensitive Malaysian manufacturers also could suddenly find themselves at a competitive disadvantage relative to foreign producers not affected by changes in Malaysia’s energy subsidies. The critical issue facing the government, therefore, may not be not whether or not to cut subsidies, but by how much and how fast, to cushion the potential impacts on its already thriving industrial sector. The Malaysian government also has elevated energy efficiency as an important element in its energy policy framework and economic plan. This position has been driven by concerns over the security of the nation’s energy supply, the depletion of indigenous energy resources and climate change, and the need for mitigating growing energy demand in the economy. High energy subsidies are an important factor that hinders energy efficiency improvement efforts, however. At the same time, increasing industrial energy-efficiency can help offset impacts of rising prices as subsidies are removed. Policy Impact assessments. The report then highlighted the importance of being able to assess these impacts, to better understand the possible competitiveness consequences for Malaysian manufacturers, and for Malaysia’s economy as a whole, if the Malaysian government enacts policies to reduce or eliminate energy price subsidies. It also is important to assess the transitional costs and the effectiveness of different options for phasing out the subsidies while also promoting manufacturing competitiveness and economic growth. This includes policies and strategies to promote substantial energy efficiency gains in Malaysia’s manufacturing industries. High Road Strategies (“HRS”), in Arlington, Virginia, USA and the Millennium Institute of Washington, DC, have collaborated in analogous studies (also employing System Dynamics models) that could lend useful insights about these impacts, though the context, nature and specifics of the problem examined are quite different from the Malaysian situation. 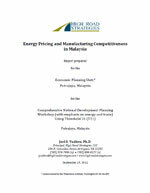 Perhaps equally important, the HRS-MI studies provide a research and evaluation methodology that could effectively be applied to quantitatively estimate and compare the potential economic and competitiveness impacts of different policy options the Malaysian government might consider regarding the reduction of energy subsidies. The report summarizes the principal elements of the HRS-MI studies with attention given to how they might apply to the Malaysian energy subsidy policy problem. The report also discusses industrial energy efficiency potential, barriers and opportunities as examined in earlier High Road Strategies projects (e.g., the Ohio Advanced Manufacturing Energy Policy Project). The report concludes with a discussion of the implications of the HRS-MI studies and High Road Strategies’ industrial energy-efficiency analyses for Malaysia’s energy policy challenge, and how they can be applied to comparable analyses of Malaysia’s energy subsidy policies. It is suggested that the methodology and approach for evaluating energy policy impacts and options used in the HRS projects could be applied to analyzing both the economic impacts and potential transitional strategies that could help Malaysia achieve greater manufacturing competitiveness and economic prosperity.